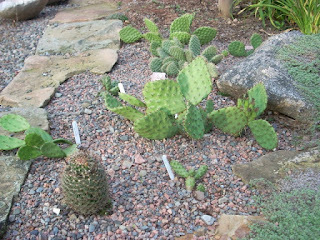 Prickly Pears (Opuntia) are edible. You can eat both the pad (nopales) and the fruit (tuna), although I haven't tried it. A word of caution, remove the spines first. 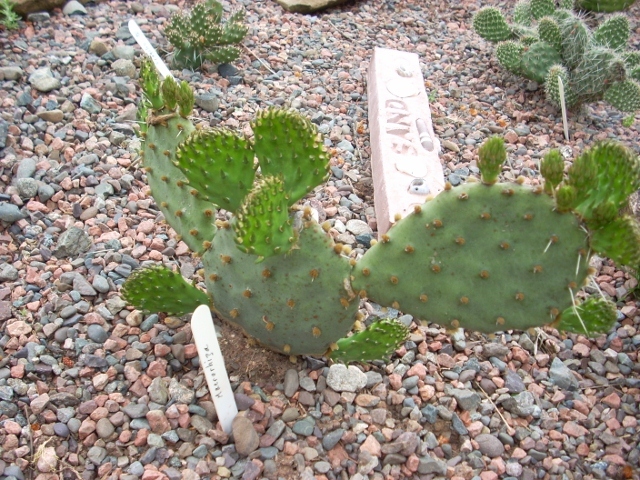 The Cactus are full of water, so considering where they grow, they are a very attractive food source to other animals, hence the need for defence mechanisms of the spines. 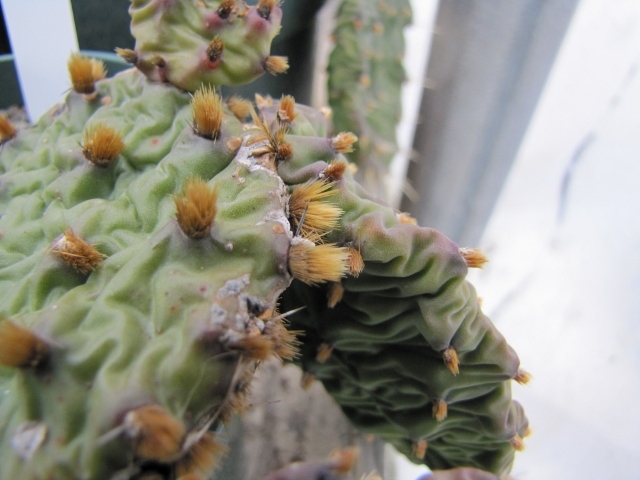 Those spines are lethal, and it is not the large ones you need to look out for, but those small, tufted hairlike ones in clusters that are no more than a few millimeters in length.. Regular gardening gloves are not enough, they will go right through. They will even go through several layers when leaning over the pots on a greenhouse bench. Then you are back in the house looking for the tweezers. There are some varieties that are spineless. The best way to work around them either when propagating or weeding around established plants in the garden is to use good old kitchen tongs and yuo do need to be careful. Use your tongs to grab the weed, a small, long handled dandelion weeder to loosen it from the ground and gently pull, at least the soil mix is very loose. Moving established plants requires a shovel (they have quite the root system) and good leather gloves. Most varieties are quite tough and will not break off with out a lot of force. Propagation is really easy. They will produce viable seed. I germinated mine with GA-3 but have hear that scarification also helps. If you leave the seed pods on the plant for a year, they will drop and germinate much easier. I have established quite a nice one from seed that resembles the O macrorhiza but the pads seem to be larger and the plant a bit more vigorous. 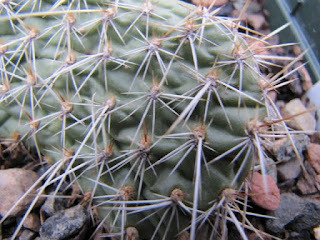 I also have one appears to have many more spines, much more like the O. polyacantha which gives it a more silvery look. 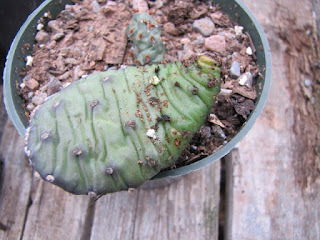 Propagation by pads is probably the the easiest and more reliable way to go. Using your tongs to hold a pad, cut off the pad where it had joined to the other ones. Allow the pad to lay out for a few days, even a week, they need to callus. I have left them in the greenhouse in direct sunlight and they have been fine. After that pot them up in the soil mix suggested in the previous blog and they should root in within the month. 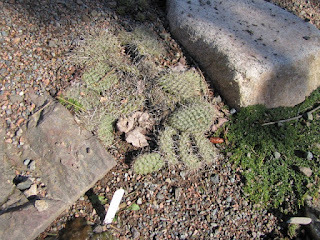 I have said before that these cactus can take the cold: they can. What they can't take is the wetness especially in the spring. In the fall, make sure any debris from trees and other sources are removed from around the plants. 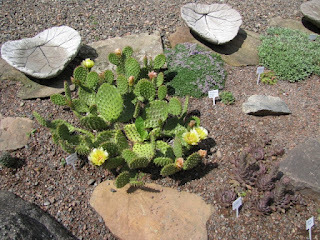 The Cactus will start to show signs of going dormant by starting to shrivel, they will also start to go from the pads being prostrate, to them lying on the ground.. This is a mechanism that allows them to overwinter. In the spring, when the snow is gone they look pathetic. But if they have not gone to mush or jelly, then they are usually fine. Last winter with all that snow, a few of the pads turned black. Those pads were dead and they needed to be removed. The rest of the plant was find. As the spring warmed, the pads went from being shriveled to filling with water and becoming prostrate again. Late spring, you started to see small knobs forming around the edge of the pads. New pads were being formed. At the first of the summer flower buds start, they don't look a lot different from the newly forming pads until they get a bit bigger. Most of the cactus that do well here have yellow flowers, but reds, pinks, and salmons are available. The flowers don't last long, they are a lot like peonies and poppies in that respect, but they are absolutely beautiful. And just think what a great conversation starter when some one comes into your garden.